Learn more and get the Entry Form. Pony Club is a national organization, with regional oversight for each of the local Pony Clubs located within specific regions. All are run according to the by-laws of the national organization. The Whidbey Island Pony Club is active mainly in the areas of dressage, show jumping, and combined training competitions (3 day eventing). In some areas, the Pony Club is based at a particular stable. Most of the horses and riders stable and take lessons there. This is not the case for our club. Most of our members board their horses at home or at various locations in the Oak Harbor, Coupeville, South Whidbey, or San Juan areas. For this reason, each member must transport his/her horse to the lesson site. A parent or guardian must attend the lesson. This is a wonderful way for parents to see improvements as well as observe any problems their child may be experiencing. There is a good deal of socializing in Pony Club, but this is not the main aspect of the club. 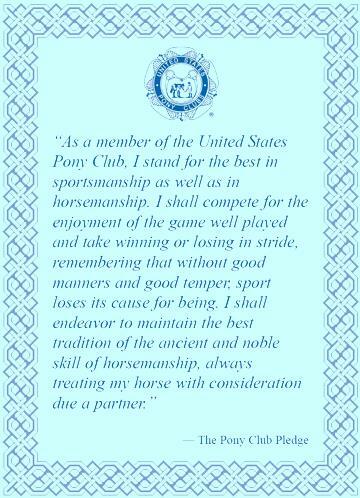 The main aspect is to teach horsemanship and sportsmanship. Membership requires many hours of hard work and diligence. It requires parents to be supportive, patient and committed to their child's success. Families are expected to participate in club activities, regular meetings, fundraisers, and Pony Club sponsored activities. Our families make a significant time commitment to helping with the local Whidbey Island Horse Trials, a 3 day eventing competition, every July. Work to prepare for the event generally begins as early as April and builds to 100% during the event. A club news blog is available at whidbeyislandponyclub.blogspot.com; parents need to check the blog as well as the club calendar to stay aware of what's happening in the club and not rely solely on information from their children in this regard. To see the clubs private as well as public events go to the calendar page of this website. If you are a club member and need help with the calendar, contact any of our officers.